Hormone Replacement therapy (HRT) is the most effective and commonly prescribed treatment for menopausal symptoms. As the name suggests, it replaces the hormone oestrogen that is lost during the menopause. You can take HRT as tablets or through a patch or gel on your skin. Women considering HRT have lots of choices! There is not only choice in the type and dose of hormones available, there is also choice in how these hormones are introduced to the body — or what doctors call “the route of delivery". HRT helps to relieve the symptoms caused by oestrogen deﬁciency in women — such as hot flashes, night sweats, vaginal dryness and osteoporosis. Every woman is an individual and the HRT that will best suit you will depend on your individual circumstances, including your stage in the menopausal process, and whether or not you've had a hysterectomy. 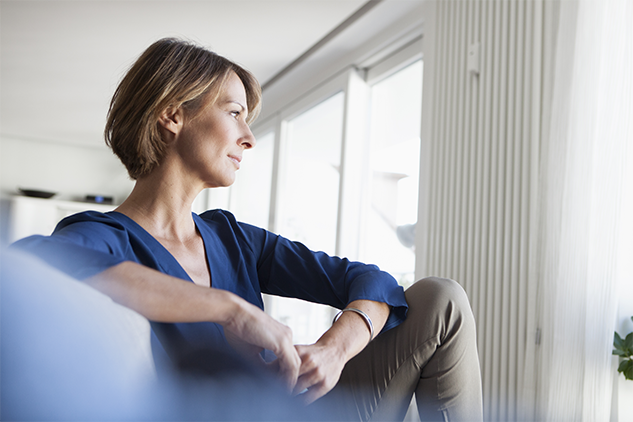 Not all HRT treatments are the same; it is essential that you understand both the short and long-term beneﬁts and safety proﬁles of each to ensure that you maintain the best possible health and quality of life at every stage of the menopause. Your healthcare professional will discuss the HRT options with you and you both should make a decision based on your individual needs. Most forms of HRT combine different amounts of the hormones oestrogen and progesterone (manufactured progesterone is called progestogen in the UK). The core ingredient of all forms of HRT is oestrogen. Oestrogen relieves symptoms such as hot flushes, prevents vaginal symptoms and maintains bone strength. The best HRT for women without a womb (a total hysterectomy) is oestrogen alone. Oestrogen alone can be taken as a daily tablet, a weekly or twice weekly patch or a daily gel. Varying doses of oestrogen are available. Lower dose varieties aim to reduce the incidence of side effects while maintaining symptom relief and bone strength. It is usually recommended that you take the lowest dose of HRT that will effectively relieve your symptoms. If you have a womb you should be offered HRT that contains both oestrogen and progestogen. This is because oestrogen only HRT can stimulate the lining of the womb (endometrium), leading to excess growth and possibly cancer. Therefore for women who have not had a hysterectomy, a second hormone is also prescribed (progestogen) to counteract the effects of oestrogen and protect the endometrium. Oestrogen plus progestogen is known as ‘combined HRT’. In women who have had a partial hysterectomy (with their cervix intact), some womb lining (endometrium) may still remain, so progestogen may be required with the oestrogen. Talk to your healthcare professional about which HRT would be most suitable for your individual needs. The way in which progestogen is taken along with the oestrogen determines whether or not the HRT will lead to bleeding. Adding progestogen for 10 to 14 days a month, means that a bleed occurs in the days following this course, similar to that of a natural menstrual cycle. This form of 'cyclical' or 'sequentiaI HRT’ is still used in pen-menopausal women and during the ﬁrst year or two after the menopause. Forms of hormone replacement that give continuous progestogen with the oestrogen have been developed to avoid bleeding altogether. This method is called ‘continuous combined HRT’ and is thought to reduce the risk of endometrial cancer even more so than sequential HRT. If you have had at least a year without periods and are thought to be postmenopausal, continuous combined HRT can be used. What are the risks of taking HRT? https://yellowcard.mhra.gov.uk By reporting side effects you can help provide more information on the safety of these medicines. As with any drug, there are known short-term and usually mild side effects from HRT, especially in the first few months of use. These may include breast tenderness, leg cramps, nausea, bloatedness, irritability and depression. These side effects are related to oestrogen or progestogen, and may be overcome by a change of dosage, ingredients or the route in which the HRT prescribed. Irregular bleeding or spotting can also occur during the first 3 months of taking continuous combined HRT. There is no need to be concerned but do report it to your healthcare professional at your 3-month review. If you have a strong family history of blood clots or if there‘s another reason why you are at high risk of blood clots, you may be referred to a haematologist (a doctor who specialises in blood conditions) before considering HRT. Not all HRT treatments have the same risk of VTEs. Ask your healthcare professional about individual treatment options. If you‘re already at higher risk of cardiovascular disease it may still be possible for you to take HRT but it will depend on your individual circumstances. Do ask your healthcare professional for more information. Not all HRT treatments have the same risk of breast cancer Ask your healthcare professional about treatment options. The decision to take HRT is a personal one and it depends on how your symptoms are affecting your life (and only you will know that!) it is important to remember that the choice of whether or not to take HRT is in your hands. You should understand all the HRT-related options available to you and make an informed choice about taking HRT, based on your individual needs. If HRT is suitable for you and you are interested in taking it, your healthcare professional should discuss the beneﬁts and risks with you, both in the short term (the next 5 years) and in the future, before you decide to start it.